Cruising the various flickr albums, as I always do when I'm looking for interesting new bloggers and crafters to feature here on decor8, I came across the quirky cute crochet Timmie, created by Brooklynite, Marilyn Patrizio. Timmie, who looks a bit like a muscle relaxer, is one of many darlings that Marilyn breathes to life, but her crochet creations are only one part of her world. She's a fine artist, illustrator, animator, graphic design geek, blogger, photographer... There's no much that Marilyn doesn't dabble in. You've just got to meet her, so without further gushing, meet Marilyn Patrizio. decor8: With your many interests, I'm trying to pin down exactly what you do for a living. What's Marilyn all about anyway? marilyn: Hi, My name is Marilyn Patrizio. I'm a freelance illustrator and fine artist. I graduated from the School of Visual Arts with a Bachelor of Fine Arts degree in Illustration in 2000. When I'm not stressing out about money or lack of vacation I like to eat pizza and cotton candy, collect Japanese stationery and wood products, paint portraits, and crochet myself some pals. decor8: What's your day job - the job that pays the bills? marilyn: I illustrate and animate (usually in my p.j. 's) interactive stories and games for children's educational websites and publishing companies. decor8: I notice you're in Brooklyn, what part and what do you like about it there? marilyn: I live in Bensonhurst. I like the cheap(ish) rent and closeness to my family (a.k.a. free food and washing machine). Everyone in my immediate family lives within a 15 block radius of my apartment. decor8: what are your favorite Brooklyn/NYC stores? 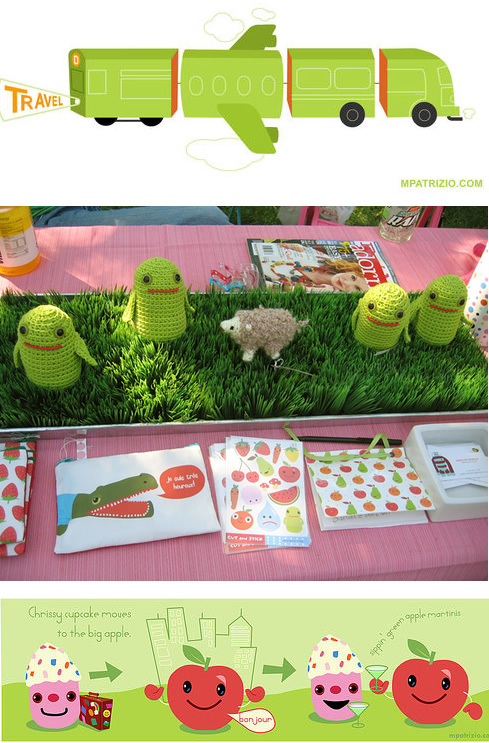 marilyn: I love Matter (who carry my softies) and Nest for their great mix of modern and handmade goods. I am also fond of Fred Flare, which is an online shop whose warehouse is based in Brooklyn (can that count?). decor8: Now let's talk about your blog, the decor8 blog of the week. Can you please tell us what you blog about? marilyn: I usually post about cute things that I've found on the internet or purchased, photographs of my crochet creatures doing silly things and the occasional illustration or painting. I originally started blogging because of Illustration Friday. I needed a place where my weekly illustrations could be archived. decor8: What do you love about having your own blog? marilyn: The connection and interactivity with people from all over the world. I'm addicted to comments! decor8: Oh, same here. What are you trying to accomplish through your blog? marilyn: To keep a visual diary of illustrations, craft experiments, paintings and perhaps indirectly to make people who view it happy and inspired in the process. decor8: Any creative websites that you suggest visiting for a daily shot of inspiration? marilyn: Illustration Friday for those who like to make pictures and Flickr for everyone/everything else, I am constantly mesmerized and inspired by the images I find in people's photostreams! decor8: I'm a flickr addict, too. I have a decor8 photo stream there, but recently launched a little group for stationery lovers called We *Heart* Stationery. 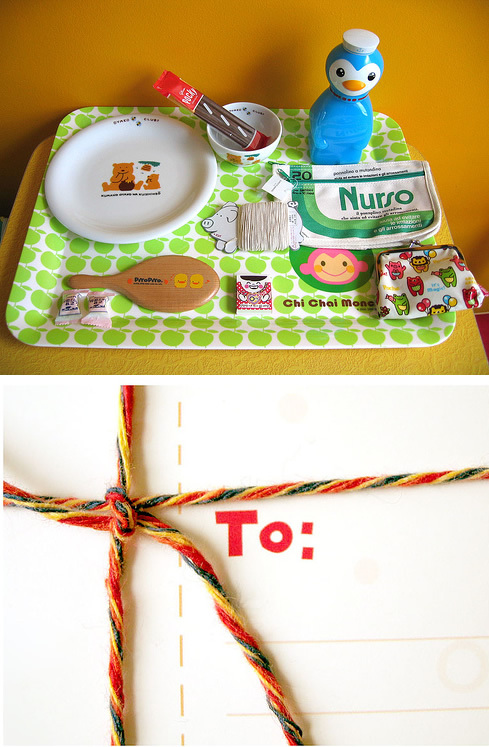 Speaking of paper goods, I love your stationery and of course, you crochet softie toys. So many people would love to start their own business like you have. Any advice for them? decor8: what are you listening to on your iPod? marilyn: I don't own an iPod and barely have a functional clock radio. marilyn: Clean, cute, and straight to the point. decor8: Where did you grow up and do you think where you grew up influenced your design style, and if so, how? marilyn: Bensonhurst, Brooklyn - "The least creative place on earth!" The only good thing about this place is the proximity to the subway station, so you can get the hell outta here quick! With that said, I don't think it influenced my design style at all, but it was and is a great base to explore the rest of NYC from. decor8: Do you have any favorite designers or artists that inspire you and why? marilyn: Tons! I get inspiration from everywhere, from Impressionist painters to graffiti artists. My paintings are influenced by the artists from the late 19th century, John Singer Sargent, Joaquin Sorolla, Anders Zorn, All the Russian Impressionists especially Ilya Repin, the American impressionists Robert Henri, Cecilia Beaux, Frank Duveneck and William Meritt Chase to name a few. All the painters above showed me how to tell a visual story in as little words/paint strokes as possible. J.W. Waterhouse for showing me what beauty really is. The American Illustrators Norman Rockwell, Dean Cornwell and N.C. Wyeth for their compositions and visual storytelling abilities. Gustav Klimt and Alphonse Muchas use of the figure as a design element. The expressive drawings of Egon Shiele. Rembrandt for his use of light. Contemporaries such as Jenny Saville and Lucien Freud for their fearless use of brush strokes. Designer Alexander Girard for his timeless patterns. Yoshitomo Nara for showing me that 'cute' can also be sophisticated and heartfelt. Graffiti artist Barry McGee for the ability of making a wall from an abandoned building, a scrap piece of wood or even a bottle into an object of art. Craft queen Camilla Engman for showing me that it is okay to experiment in multiple mediums at the same time. It is an inspiration to see how she can flawlessly maneuver between painting, illustration, and fiber arts. I've been constantly struggling internally for years about the external pressures to have a specific style or identity as an artist. And lastly, my art school classmates for the healthy competition. decor8: Let's say your feeling really down. What do you do to lift your spirits? marilyn: Purchase Cram Cream adhesive tape off of E-bay. Works like a charm! decor8: What are five subjects you'd like to learn more about and why? marilyn: Sewing- I would love to make myself clothes one day, Yoga- because the pizza and ice cream diet is working wonders on my physique. Dust- why do we need it? Go away. Swimming- I'd like to go snorkeling or white water rafting. Driving- so I can drive myself to Ikea. decor8: What is the best place that you've visited on vacation and why? marilyn: Italy- good food, fun conversations with the locals, and the connection to my roots. Oh, and most importantly the shoe shopping! decor8: What are your top ten indulgences? marilyn: In no particular order of importance: 1. Nutella, on everything. 2. Japanese craft books 3. Stationery 4. Sleeping late 5. Striped Socks 6. Anything with polka dots 7. Brick Oven Pizza (at least twice a week or more!) 8. Carbs all day and all night (see #'s 1, and 7) 9. Buying art and craft supplies when I am already stocked for a lifetime and 10. Long, hot showers.